Boss Keith Curle is expecting Newport County to be ‘a dangerous animal’ when they arrive at the PTS Academy Stadium for Tuesday night’s Sky Bet League Two clash (ko 7.45pm). 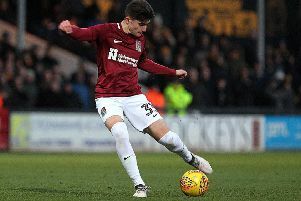 The Exiles have spent the majority of the season in and around the play-off places, but they were beaten 3-0 in their most recent match at Colchester United last weekend. Curle is expecting Michael Flynn to have his players pumped up for their clash with the Cobblers, and the Town boss says the south Wales side’s run in the FA Cup earlier this season shows the quality they possess. County saw off Premier League Leicester City and Championship Middlesbrough in rounds three and four, before losing their fifth round tie to Manchester City, giving Pep Guardiola’s men a run for their money before going down 4-1. “I think theysurprised and upset a few people in that, so they are a dangerous animal. “They are a team that won’t have enjoyed the result they had on Saturday, and their manager will be looking for a reaction. “We know about reactions at this football club, and we needed a reaction after a defeat against the same team (Colchester). “So we are mindful of of that, and understand how they play when they play well and what they do in games when they do play well and get results. “We have good knowledge on what makes them tick, so we need to combative and have our game plan. The Cobblers go into Tuesday’s game off the back of a six-match unbeaten run, and having won three matches in a row. Newport are 12th in the league two table, but Town will go above them if they were to win at the PTS on Tuesday.